I’ve begun loading a selection of photos to HistoryPin, which is a “way for people to come together to share and celebrate local history. It consists of a shared archive, a mutually supportive community and a collaborative approach to engagement with local history.” HistoryPin allows us to share our collections in a new way by making it easier to see images in geographic and historical context by way of timelines and Google StreetView mashups. I uploaded a group of San Francisco photos to start, including a group of gorgeous Lothars & Young prints of the SF waterfront and Sea Cliff neighborhood in the 1920s, as well as some featuring Sonoma County residents, including the late Petaluma Library librarian Maxine Kortum, shown above outside the SF Main Library about 1948. Photos can be “pinned” to a collection (including collections other members create) and arranged for tours. We will pin more photos to the SF collection as well as to other collections as time allows. In the meantime, HP members from around the world have uploaded tons and tons of great images and more that tell stories of their communities — have fun exploring! 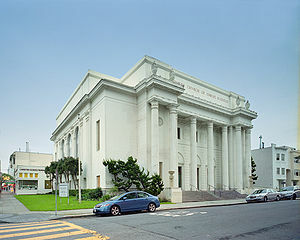 The Digital Public Library of America (DPLA) came to the Internet Archive headquarters in San Francisco on April 27. 300+ participants filed into the pews of the former Christian Science church at 300 Funston Avenue to learn about the progress since the project began in 2010 with a vision of creating “large-scale digital public library that will make the cultural and scientific record available to all. ” (DPLA wiki). Speakers at the “Church of Brewster” [Kahle] included librarians, technologists, publishers, archivists (notably David Ferriero, 10th Archivist of the United States–by phone), programmers, and open-government activists. Initially funded by a grant from the Alfred P. Sloan Foundation and operated out of Harvard’s Berkman Center, the DPLA has just become its own 501(c)(3) nonprofit so it can apply for additional funding. The target date for a public alpha release is April 2013. Of the many speakers, two stood out for their fervor (appropriately delivered from the dais of the old church), but in very different ways and on different topics — Dwight McInvaill of the Georgetown County Library (SC) and Carl Malamud of Public.Resource.Org. McInvaill described with great enthusiasm his library’s efforts to create a digital library that sounded very similar to our own project. Malamud, on the other hand, preached on the need for making government documents — in particular, public law — freely available and reversing the current situation of referenced materials in the Code of Federal Regulations often being available only at a steep price. Malamud received a big round of applause when he stepped down from the pulpit…er, lectern. For now, we’ll be watching the DPLA to see where it goes and will look at how our project might contribute.